Yesterday was Autumn at its glorious best. The sky was bright blue, clear but for a few slowly forming stark white clouds that merged into light overcast as afternoon progressed. I went out on a walk with my camera. It was the first time in ages. Not only did I not blog all Summer, I stopped taking photographs as well. 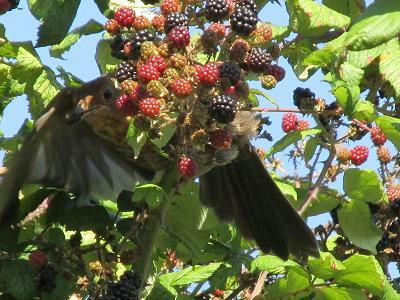 I got some of a thrush feasting on blackberries. and turning leaves. I walked with meditative deliberateness, aware of each step and noticing any slight movements or sounds. It was an alive walk. I felt alive in a way I hadn’t for many months. The world was alive, even as it was beginning the process of retreating and dying back for the Winter ahead. I did my last picking of blackberries of the season. And I assure you there were masses left for the birds — it seems unfair that the biggest and plumpest ones are way out of reach for us — but I smile at that thought and wish the birds well in their feasting. I walked through the local recreation ground on the way to the Harvest Festival and Fete and also on the way back. 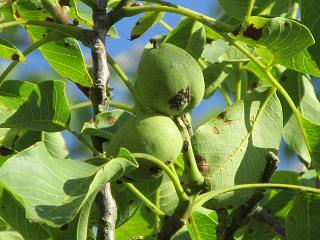 I stopped to notice that the huge Oak Tree had lots of acorns this year and fewer knopper galls. This made me happy because last year there were no acorns that I could see when I walked by a few times. I spent more time approaching the Oak on my return. It seemed to be something I needed to do. I felt a deep sense of reverence for this huge wide spreading tree. He is a magnificent specimen. I paced out the diameter of his branch extension and it is 260! That would be feet! I walked around the trunk as well and it came to 16. It seems a very slender trunk to hold such huge branches, but it does. As I circled in towards the trunk, after pacing it all out, I bowed to him, I have always thought of this tree as he, and when I got close enough I reached out my hand. Immediately there sprang between us a link, some connection. By the time I was close enough to touch the bark he began to speak to me. ‘Welcome daughter‘ were his first words.I pulled back a bit and shook my head. This tree had never spoken to me before. There is a bigger, older Oak on a field boundary out beyond the village in the opposite direction whose name is Reverend Mother. She is very conversant. Last spring when I was walking there she asked me, it felt more like pleading me, to save some of her children. 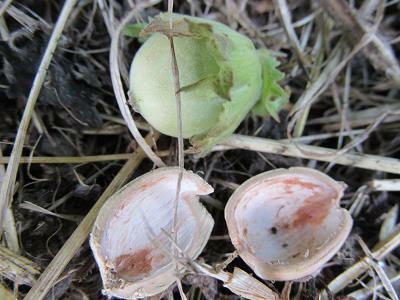 A number of very small Oaks were growing where they would be smashed by the tractor when it came to plowing. 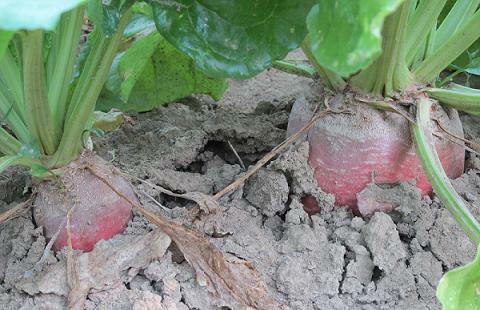 A few days later, I went back and working through the hard ground managed to retrieve two healthy seedlings. 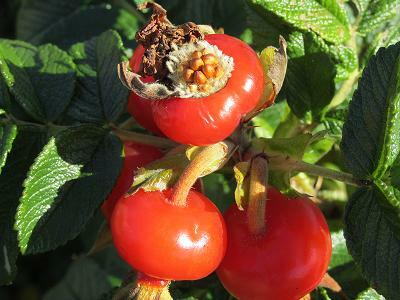 They are in pots and doing well, growing at the slow Oakish pace. After a quick regrouping, I moved towards him again. There was a rush of recognition, from where I could not tell you. He told me I must visit more frequently. He assured me my roots were as securely placed in the soil of this land as his. A reassurance I had not expected. He flooded me with strength and energy. I am sure he is capable of being strict when he wants to be, but yesterday he was all gentleness. Maybe so he wouldn’t scare me away. 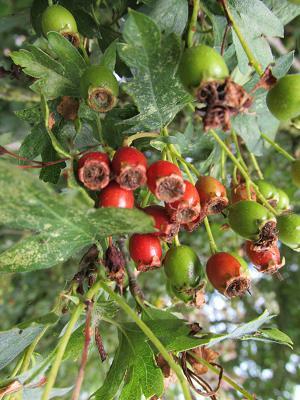 On the rest of my walk home, I thought about my genealogy in relation to trees, to specific trees and groups of trees I have made connections to and with since moving to Somerset. I wondered how would I plot, quite literally, my family tree. 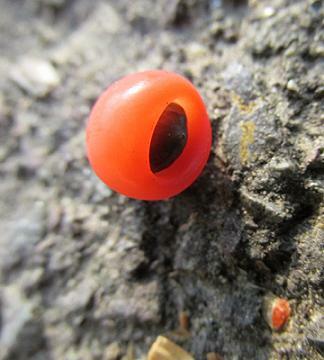 Though I know I am a daughter of the Yew, I see that at being in the sense of Yew, or a particular Yew (whom I’ve also written about) as, in relation to me, a grandmother/generational matriarch. My connection to the Yew is long standing and sacred in a way that other trees aren’t to the same depth, though Willow is very close in this regard. But I am sure now the other relationships will also deep, broaden and strengthen. This was an exercise to try and look at very personal way of relating to particular trees in my environment. Since it flowed so effortlessly out my my encounter with the Father Tree, it seemed a valuable way to comprehend my relationships with certain trees. For some the relationship is fairly generic, there isn’t a particular tree I can identify with the assignment that feels right, well, not yet anyway. 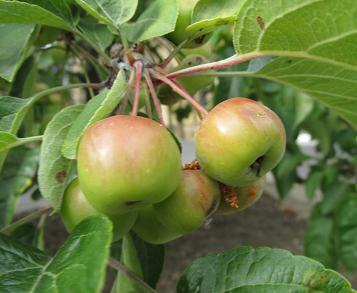 This is the case for Apple, Holly and Hawthorn, but I’m sure there is one waiting for me to meet it. With these three trees I have a general connection, maybe because Holly and Hawthorns are hedge dwellers and Apples are orchard trees. 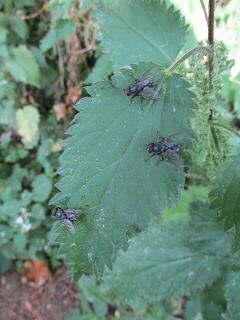 They live in groups and so to perceive an individual voice is likely to be harder to discern. I believe I have written before of the Oak tree in whose lap I ran to sit in on the way to the grocery store every week with my mother and brother. Looking back I would say she was more a Nanny Tree. She was a source comfort and familiar presence with whom I felt safe and understood by in a way I never did with my human family. At the time I could not have said why I felt that way, and it was not anywhere on my young radar that over fifty years later I would feel a so much stronger protective and profound connection to the Tree Folk. If anything that experience enables me, all those years later, to accept the gifts of connection with and claiming by the trees who ‘people’ the land and landscape which I Know is home. These connections will continue to unfold and the understandings expand for me. It seems no accident that all this is following on what happened on the Autumnal Equinox. This deep, broad and intense Knowing is so sacred that to speak of it is like liturgy and prayer for me. So, this is a liturgy and prayer I am sharing with you. combines rake the fields bare. ‘come join my swirling dance’. could be the catalyst of casualty. 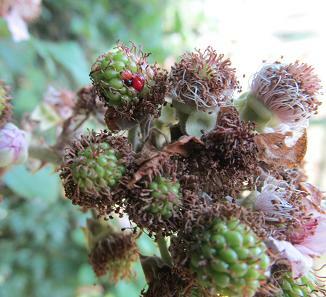 where berries mark the place? The Grain does not know . . . 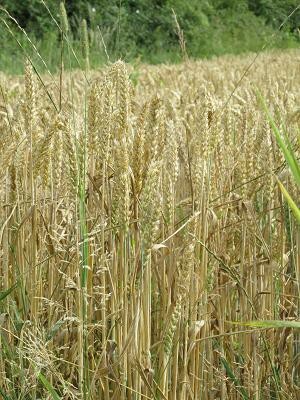 The Grain does not know that the Harvest is coming. This message came to me over a month ago and settled into my awareness and went silent for a while. 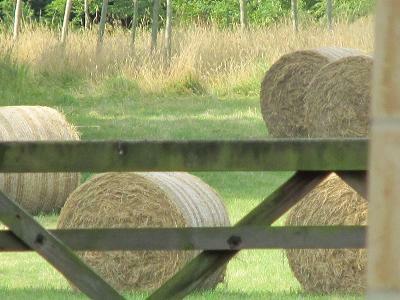 Several days ago it came back, chanting and pushing and insistent – a Lammas warning, perhaps. I heard this originally pertaining to a certain dream series I had several months ago that were about an personal matter. But, it has wider meanings this time of the year. 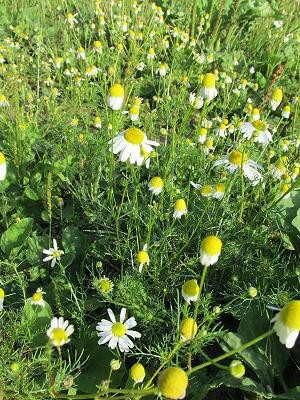 As I walk out into the countryside, the delicate scent of camomile wafts from the field boundaries and on the path flies are zizzing all around me through the stinging nettles. 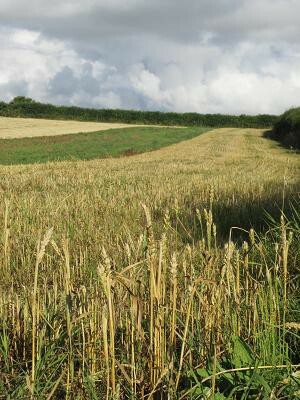 Along the way I saw the one of the wheat fields had been harvested, and another had not. The grass is rolled for storage. The maize tassels are turning russet brown in the bright sun. 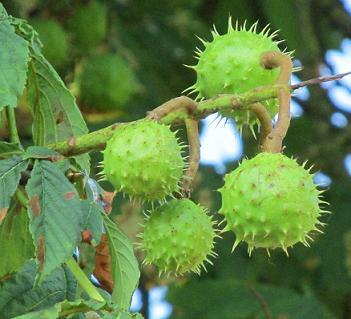 The walnuts and conkers are ripening on their respective trees high above my head. 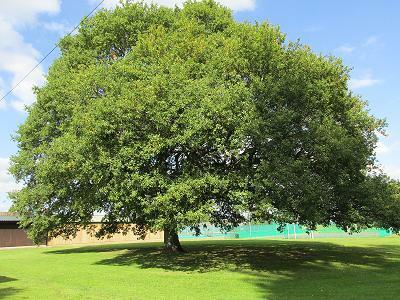 I have not yet seen acorns, but not visited the tree who might bear them in a few weeks. 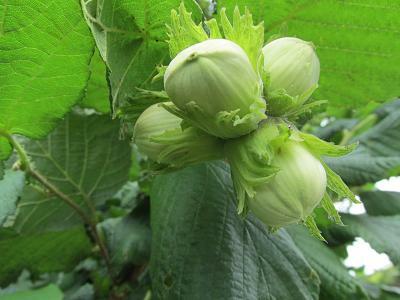 The hazelnuts are already being harvested though shells are white and their covers are still downy green and soft, not yet nut brown and dry. 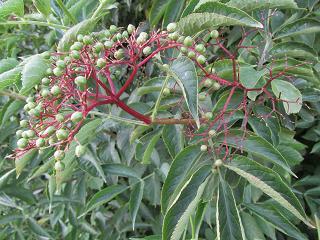 The elderberries are still green and compact, though sparse. 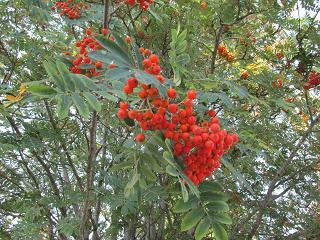 However, some rowan berries are red ripe. 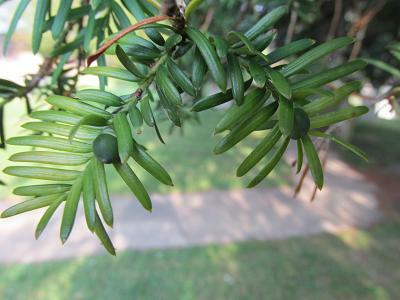 I saw one ripe yew berry, the victim of hedge trimming, but most are still green. 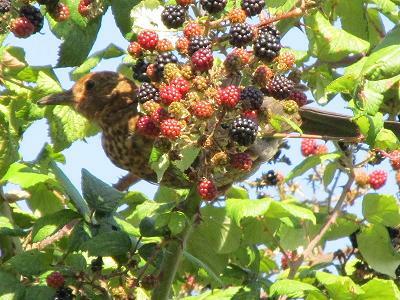 The haws are turning on some trees and a few blackberries are making an attempt to ripen, but the dry spell, even after all our rains may bring a meagre harvest for the creatures to forage the hedgerows, and for the latter I include me. 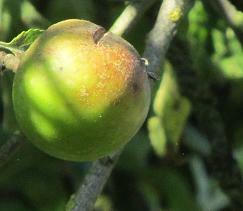 The apples are blushing in the sunshine. 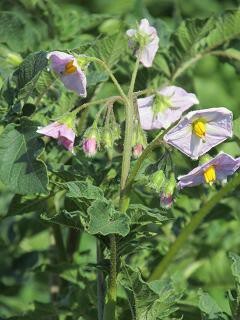 The mangel wurzles are bursting from the ground; tatties are still flowering, though some are prepared to be taken from the earth. These photos are idyllic, pastoral, speak of the way of the seasons. The natural order of being. Yet, the words still haunt me. They make me squirm. They make me think deeply about every day in the bright, hot summer. I find it difficult in part because summer has never been my best season, beyond the mosquito bites to which I am allergic and the absence of school when I was younger. I know that the light emanates from sun and shoots out into the bleakness of space. Some of it radiates this planet we call home in the precise amounts to allow us to live, unless we mess it up and lose the ozone layer and cover ourselves in too thick a blanket of CO2. All that science acknowledged and intellectually understood, the part of me that deals with and senses and feels the energies of all that surrounds me tells me that the plants and the animals invoke the light and call down the heat at this time of year. This is the oppressiveness that I feel nearly every summer, except when their calls go unheeded and it is damp and chilly and mostly overcast. 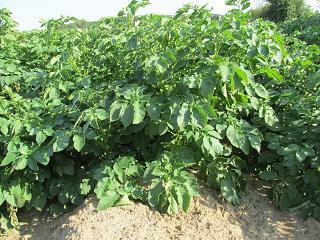 In the height of summer even the shade can feel too heavy as the leaves pull in the sun’s energy and they turn a dark green, and often crackle in the wind. The summer is not passed. 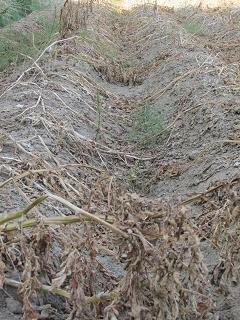 The harvest is beginning. The days are gradually contracting, but it is still hard to notice. The sun feels brighter and hotter, though we are slowly tilting away from its strength. 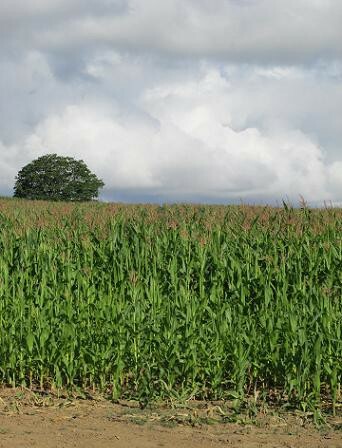 The wheat and maize are standing tall and stiff until they are taken down. The winds glide in graceful patterns over the barley fields. The oats shake and nod in the breeze. None of the individual stocks or stems knows their fate. None of them realise they work for us. None of them know we humans will in due course take their lives away. And we and the other creatures do so to sustain and maintain our lives in the great food chain by and in which we are all, as living beings, bound. Sobering thoughts. Serious contemplations. In the wider understanding of consumerism, we may not giveth, but we surely have the power to taketh away – take away the life of any other creature or plant that is in our way, that we can exploit for gain, that we can create a demand for. And in so doing we destroy a little more of ourselves. We continue to reap what we cannot sow. In many cases what can never be sown again. The Grain may not know that the Harvest is coming, but we do.